Our range of bottleless executive coolers offers a stylish way to get chilled, clean and filtered water from a mains water supply. Our engineers will come and install the coolers and 6 monthly sanitisation are available for £75. For your £75 you get a visit from one of our engineers who will fit a new filter, sanitise your cooler and clean everything up leaving you with a perfect clean and healthy cooler. Home Water coolers is a sister company of The Water Delivery Company and The Water Cooler Company, all rental contracts for bottleless coolers taken out will be with The Water Cooler Company. 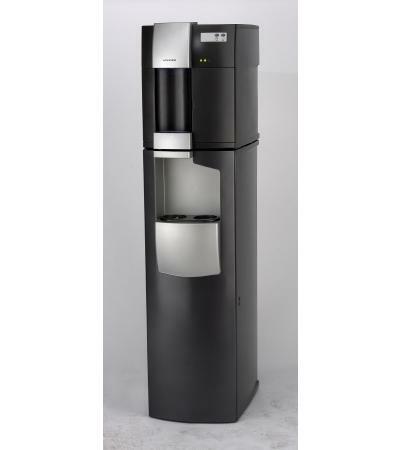 The Elite is a high capacity mains-fed water cooler available in a very high quality finish. This bottleless water cooler provides high volumes of chilled water by using a direct chill process and is available in floorstanding or countertop models. The Elite can be rented from £6.00 per week – dependent on contract length. Advanced energy-saving sleep modes combined with the use of environmentally friendly R134a refrigerant gas make this a very ecologically friendly watercooler. This bottleless water cooler also features an integral stack cup dispenser which is at the top of the cooler with a capacity for 100 cups and has a neon light that lights up the area around the cup. Hot and cold or Cold only, Ecologically friendly R134 refrigerant gas. The Enki Water Cooler is the world’s first designer water cooler. Designed by Jacob Jensen, the water cooler is at the cutting edge of design and functionality and will add to the style of any office or home. The Enki can be rented from £8.50 per week – dependent on contract length – but for March 2010 we have reduced the cost to £7.00 per week. 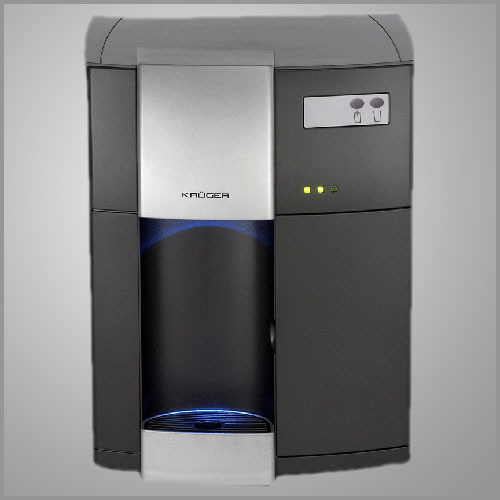 The Kruger is a high capacity mains-fed water cooler available in a very high quality finish. This bottleless water cooler provides high volumes of chilled water by using a direct chill process and is available in floorstanding or countertop models. The Kruger can be rented from £7.00 per week – dependent on contract length. Advanced energy-saving sleep modes combined with the use of environmentally friendly R134a refrigerant gas make this a very ecologically friendly watercooler. This bottleless water cooler also features an integral stack cup dispenser which is at the top of the cooler with a capacity for 200 cups and has a neon light that lights up the area around the cup. We also offer the Kruger and Enki bottleless water coolers for purchase. Please note all prices are ex-VAT which will be added when you pay.